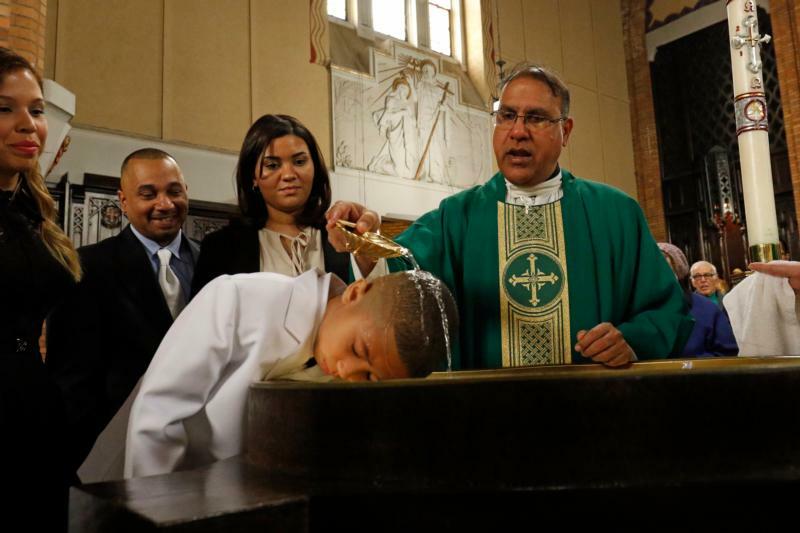 The Catholic practice of baptizing infants is an “immemorial tradition of the church” according to the Catechism of the Catholic Church (No.1252). Documents exist from as early as the second century that explain the practice, calling infants “children of God,” a phrase used only for those who had been baptized, and explicitly mentioning the baptism of infants, the 1980 “Instruction on Infant Baptism” states. Infant baptism was particularly strong in Africa, the instruction also notes. While the Bible does not explicitly mention infant baptism, the practice quite likely developed in the earliest days of the church. As the catechism puts it, “it is quite possible that, from the beginning of the apostolic preaching, when whole ‘households’ received baptism, infants may also have been baptized” (No. 1252). There are several passages in the Bible that mention the baptism of “households.” The first appears in Acts 16, which records the story of St. Paul’s visit to Philippi in Macedonia. There he met Lydia, “a worshiper of God,” who was so moved by Paul’s message of salvation in Jesus that she and her whole household were baptized (Acts 16:12-15). While none of these passages explicitly mentions the baptism of infants, infants are not explicitly omitted either. The use of the word “household” suggests that everyone that lived as a part of that family would have been baptized — including children and other relatives, family servants or even slaves. Why would any infants or young children in the family not be included? In baptism we experience the “shear gratuitousness of the grace of salvation,” not because of anything we do or say but simply through the freely given gift of God’s saving love for us (No. 1250). Isn’t the baptism of whole households, including infants, a perfect example of this? Jesus said, “Let the children,” including infants, “come to me” (Lk 18:16), but he calls us all, whatever our age at baptism, to live a life of faith. Baptism marks the beginning of that life of faith, not the end. Mulhall is a catechist living in Louisville, Kentucky.